WHY THE FUSS NOW ABOUT GEORGE SOROS? On 1 Nov 2016, the Malaysian Malay Network (JMM) lodged a police report and handed a 24-page “secret” document to the police, allegedly showing the involvement of a local businessman and Soros in funding Bersih through the OSF, with malicious intent to topple Prime Minister Najib Razak. KUALA LUMPUR, Nov 12 ― The police have not found any evidence to support allegations that American billionaire George Soros was funding Malaysian civil societies to undermine Putrajaya. Deputy Home Minister Datuk Nur Jazlan Mohamed said the Open Society Foundations (OSF) founded by Soros has been supporting environment-related programmes here for the past decade, The Star Online reported this evening. “Police have not found any proof to show that OSF or NGOs in Malaysia are using foreign funds to organise activities that threaten the nation’s peace,” Nur Jazlan was quoted saying in Johor Baru. Several local NGOs, including electoral reform group Bersih 2.0, the Malaysian Bar and news portal Malaysiakini have come under police scrutiny after they admitted to receiving grants from OSF. Some pro-government outfits then claimed the funds were used to organise activities to oust the democratically-elected Barisan Nasional (BN) government. Despite the denials and explanations by Bersih 2.0, the Bar Council, Malaysiakini and OSF, the allegations persist. KUALA LUMPUR: George Soros’s Open Society Foundations (OSF) have so far spent more than USD13 billion (RM54.4 billion) on various activities in numerous countries. The total OSF budget for 2016 is USD930.7 million, according to information on its website. All the information provided seems to indicate that the OSF gives grants for projects and programmes that are beneficial to society, including giving educational opportunities to Syrian refugees and fighting Islamophobia. It is not only involved in promoting human rights and governance but also in ensuring better education and public health, and opportunities for youths to improve themselves. The website also contains interviews with grantees of the OSF. George Soros is the founder and chairman of the Open Society – a network of foundations, partners, and projects in more than 100 countries. PETALING JAYA: Former law minister Zaid Ibrahim has praised Hungarian-American billionaire George Soros for being one of many American billionaires who “use their money to do good things”. In his latest blog posting titled “Hail George Soros”, Zaid called Soros a “great man” and cited the latter’s generosity, and interest and commitment in safeguarding basic human rights, liberating people and reducing poverty. According to Zaid, Soros was the first to come to mind when he was looking to fund a civil liberties organisation he was involved in setting up some time ago. “I’ve heard a lot about him (Soros), his generosity and great wealth from his books and newspaper reports. “He is known for contributions towards promoting human rights and education around the world. I even went to New York to visit his Open Society Foundations (OSF) headquarters, but I was unable to see him,” Zaid wrote. Zaid then congratulated news portal Malaysiakini and electoral watchdog Bersih, both of which, it was recently alleged, had received funding from OSF. He told the two organisations not to be “too worried” about calls from ministers to investigate why Soros was funding them. Zaid then asked local tycoons to emulate the “good work” of Soros and others like him. KUALA LUMPUR: The Malaysian Malay Network Organisation (JMM) handed over a 24-page secret document to police today, believed to contain evidence that suggests the involvement of a Malaysian businessman and billionaire George Soros in funding the Bersih movement. JMM president Azwanddin Hamzah said the donation channelled to Bersih was made via the Open Society Foundations (OSF) led by Soros. “This is solid and valid evidence, not crafted. Therefore, we ask the police to investigate the businessman and to take action against him because this is treason. “They have malicious intent and work together to topple the government and Prime Minister Najib Tun Razak,” he told reporters after lodging a police report and handing over the document at the Dang Wangi police headquarters here today. Azwanddin confirmed that the document also contained the amount of money received by the movement. Soros, the American billionaire had been accused by Mahathir of plotting to place a puppet regime in Malaysia. The campaign to demonise the opposition with the George Soros bogey that is being played out in the mainstream media today appears to have been hatched by a government agency since mid-year. The Special Affairs Department (Jasa) of the Information, Communication and Culture Ministry earlier this year published a thick handbook called ‘Guide to Explain Current Issues’, which provides the basis of the campaign. Among others, it claims that PKR de facto leader Anwar Ibrahim received funds from the currency speculator to face elections. It argues that Soros is a Jewish Zionist agent and had purportedly funded the International Crisis Group (ICG) where Anwar is a member via the Open Society Institute (OSI). “… Anwar is among the ICG’s exco member… a large portion (of leaders) in the ICG are Jews,” said the 322-page book. The supposed Anwar-Soros relations is contained in a chapter titled ‘ICG and (its) relationship with Zionists’, one of 22 chapters addressing various issued and programs raised by Pakatan Rakyat since June. If BN’s attacks on alleged links between human rights NGO Suaram and billionaire currency trader George Soros hold true, then a vote for Prime Minister Najib Abdul Razak is a vote for Soros as well, Pakatan MPs said today. “I want to see how the mainstream media takes up this issue. As we know there was a secret meeting, where Najib asked for Soros’ support for his global movement of moderates. “So, if Soros is the bogeyman, then a vote for Najib is a vote for Soros too,” PAS’ Kuala Krai MP Dr Hatta Ramli told Malaysiakini. Hatta stressed that Pakatan Rakyat wouldn’t want to play on the issue. However, since the Soros link has been played up by the BN, it now appears that “their own weapon has turned upon them”. Hatta said this when asked to comment on the quiet chat Najib reportedly had with Soros at a posh hotel in New York, just before his inaugural address to the United Nations General Assembly two years ago. Former Prime Minister Dr Mahathir Mohamad has declared that voting the opposition was to vote for billionaire George Soros’ alleged attempt to colonise Malaysia. In an commentary which appeared in the New Sunday Times today, Mahathir had quoted several sources stating Soros had attempted to do the same to Hungary, Ukraine and Georgia in the past. The underlying theme among those quoted by Mahathir was that Soros had funded NGOs to build up a “civil society” to pave way for “colonisation” by global capital. “Some may remember Anwar Ibrahim’s fondness for ‘civil society’ when he was in the government. He still talks about civil society now. 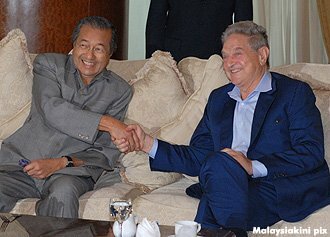 “The similarity of ideas between the two, Soros and Anwar (left), is significant,” wrote Mahathir.For Mahathir, one such proxy for Soros is Malaysiakini, which he regarded as a NGO out to do his “evil” bidding, putting “his kind of people” in power.”He (Soros) regards Malaysiakini as the NGO to manipulate in order to achieve his objective. 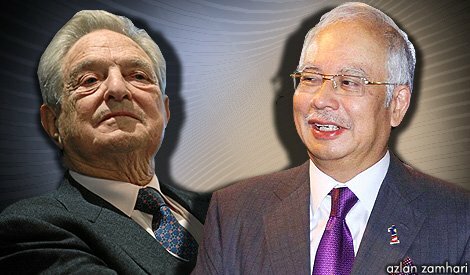 Prime Minister Najib Abdul Razak today admitted that he had met with controversial currency speculator George Soros two years ago but it was Soros who wanted to meet him. He added that it was “just a courtesy call” and nothing “sinister” happened. “Yes, I met him (Soros) upon his request, and after (former PM) Dr Mahathir (Mohamad) met Soros I didn’t see a problem with that. “It was a normal courtesy call. Nothing untoward, nothing sinister, nothing to worry about” he said, matter of fact. He added that the important thing was “not that I (the PM) met him but what was discussed”. “We did not discuss about how to topple the government or to get funding, etc,” he said. He, however, declined to elaborate on what was discussed during the New York meeting, and repeatedly said that “it was just a courtesy call”. SOROS CONSIDERED MAHATHIR A MENACE TO HIS OWN COUNTRY. What’s the difference between former Malaysian premier Dr Mahathir Mohamad and the Iran’s president Mahmoud Ahmadinejad? Nothing. Both are charlatans. Both are racist to their core. Both must be condemned without hesitation and reservation. Ahmadinejad has been adamant that the Jewish holocaust during Hitler’s reign was a figment of Western imagination. Worse, it was a conspiracy to hoodwink the rest of the world into offering sympathy to the Jewish race and the Jewish state of Israel. 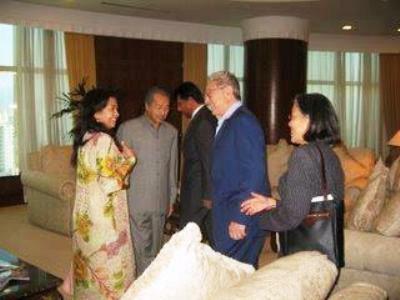 Mahathir is renowned for his anti-Semiticism. Recall, during the height of the late nineties financial crisis when he blamed billionaire George Soros and his Quantum Fund for trying to bring the Malaysian economy to its knees. All that without a shred of evidence. For which he was pasted by Soros, calling Mahathir a ‘menace to his own country’. Soros was dead right. This entry was posted in Uncategorized and tagged mahathir, mahathiur najib soros, najib, soros. Bookmark the permalink.